When being in Saratoga wasn’t enough! It’s been quite a while since I’ve communicated with you. Nicodemus had finished 2nd in the Curlin Stakes and, initially, we were looking forward to running in the Travers’ Stakes, the Mid-summer Derby. Our daughter and her beautiful family visited us, as did special friends. Boating on Lake George with Bay and the two Barbaras, as well as letting the kids drive the golf cart with me were highlights for all concerned. 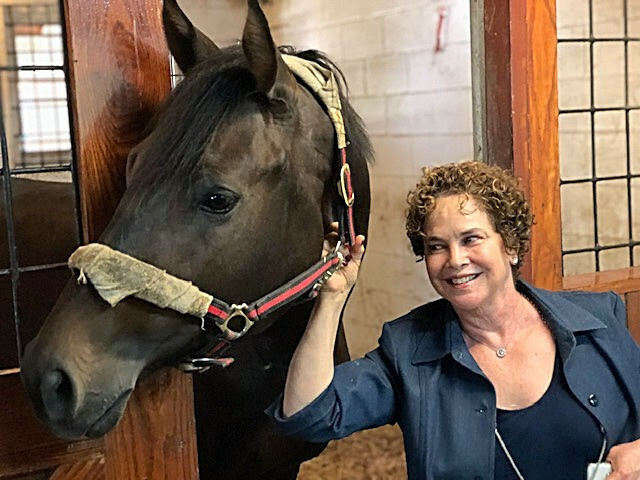 Of course, Ahvee’s Destiny, our first horse and the queen of our stable was suffering with hoof issues that could prove fatal, so we were stressed. A few weeks later, our daughter was on another trip with her family and in-laws in Cape Cod. She came down with 105 degree fever. Her father-in-law, a noted pulmonologist and his wife, took her to Mass General. After 12 days, they found that she tested positive for an anti-immune disease. It took a while for her to recover but, thank God, she has. We were stressed. 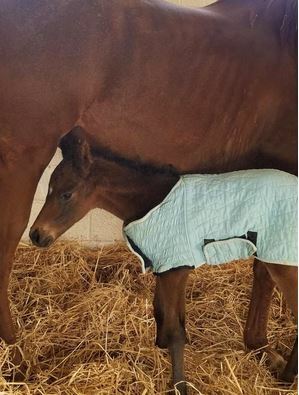 Our horses ran poorly after the initial success and two of them were added to the rolls of the injured.Dealt with problems at work and, still, Ahvee’s Destiny fought for her life and the life of the foal she is carrying. She’s still in the Equine hospital near our place in Saratoga. Before we knew it, our son and his friends arrived for Travers’ Weekend. We golfed and ate and drank and went to the racetrack. Then, we came home and grilled. Before we knew it, the weekend was gone and so were they. We spent the last week with our friends, the Haskins, and made frequent visits to see and feed snacks to Ahvee’s Destiny… love that horse! Hope she makes it through this ordeal. 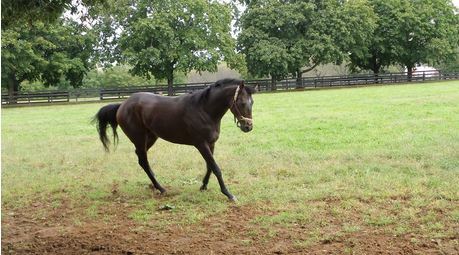 Last Sunday we went to visit Patty Hogan’s farm & Equine Clinic to see Nicodemus, Alphalfa and Wild Colonial Boy. Here’s Rhoda with him just before we switched places and he smashed his head into my face. Unfortunately, no one took any photos of me bleeding from both nostrils. Nicodemus won by a TKO. He’s a beautiful horse… and he’s really big! Anyway that’s a summary of the happenings. Hope I will be able to communicate more often. Have a great weekend!